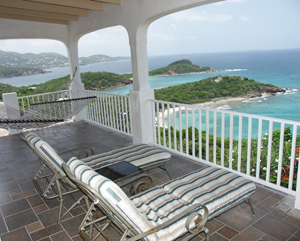 Villa Terra Nova is a two-bedroom, two-bath private home perched on a hillside on Water Island, just off St. Thomas in the U.S. Virgin Islands. 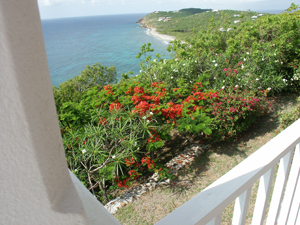 Water Island is situated in world famous St. Thomas harbor: close enough to St. Thomas so that you can enjoy all of its amenities, but when you are on Water Island you are in a quiet, secluded retreat. Water Island is developed only with private residences set on large private lots with gorgeous views. The island can be reached by ferry from St. Thomas (a convenient public ferry makes frequent runs from the St. Thomas waterfront each day). Water Island has several beautiful beaches and many scenic walks. Guided bicycle tours are available. Excursions can be booked from Water Island for tours of St. Thomas, snorkeling, diving, boat rentals, shopping and dining. The view looking down from the back deck. 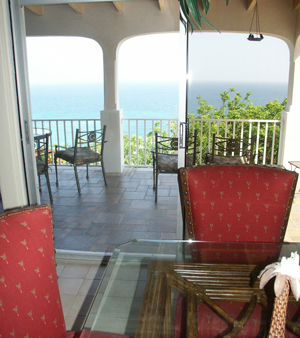 The Villa is about 180 feet above sea level. 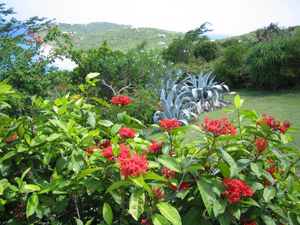 Many tropical plants grow on the property; a flamboyant tree with brilliant red blooms can be seen in this scene. This is a view from the front deck of the house. Use of the golf cart is included in the rental. Your transportation while on Water Island. The golf cart seats four and is included with your house rental. 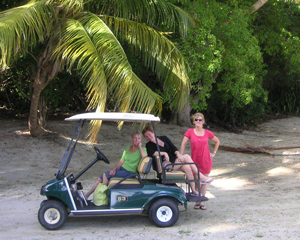 Golf carts are the most common mode of transportation on the island. The south view shows the end of Water Island as seen from the wrap-around back porch. 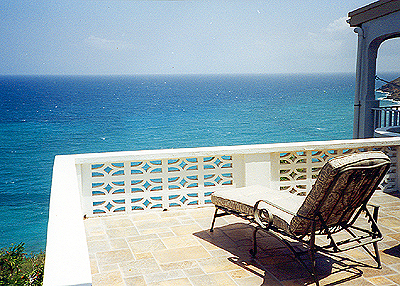 On clear days you can see all the way to St. Croix. Cruise ships sail by in the early morning and evenings. 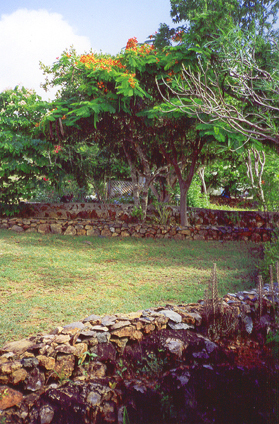 The front yard has stone edging, typical of tropical landscaping. 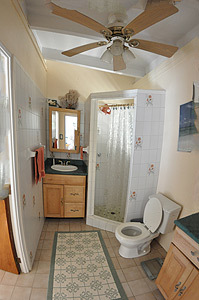 The East Deck is accessable from both bedrooms and is a great place for sunbathing. Set the table for formal dining or use the eat-at-the-bar area. The large kitchen is fully equipped. 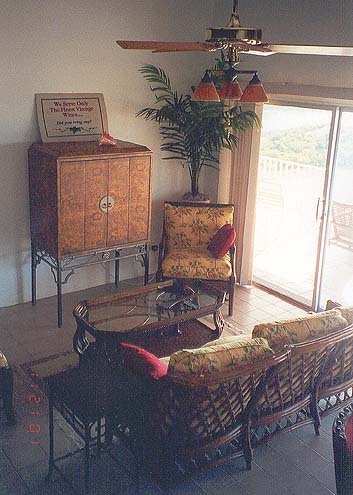 View of the living room. 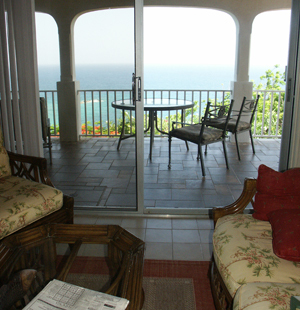 Sliding glass doors across the right side of the room provide a panoramic view of the water. 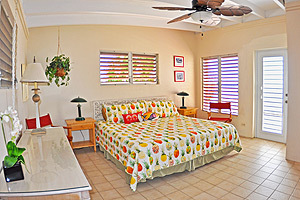 Villa Terra Nova has two bedrooms, each with a king-size bed. 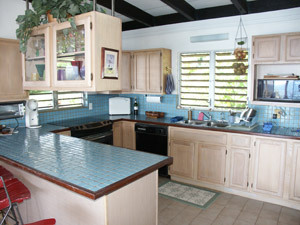 Trade wind breezes keep the house ventilated and cool. Each bedroom opens onto the deck that extends across the entire back of the house, providing a panoramic view. View from the west porch, looking out toward the end of Water Island. Flamboyant Trees, Agave and Bouganvilla grow on the villa grounds. Orchids grow in the villa gardens. 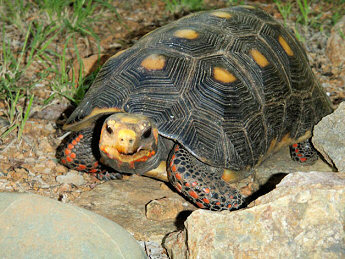 Turtles come out to graze in the evenings. 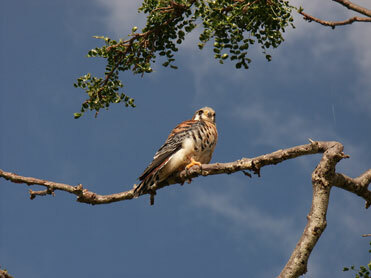 An American Kestrel, or "Sparrow Hawk" visits the Villa grounds. Kestrels are small falcons. From the Villa decks you can also spot Magnificent Frigatebirds (Man O' War birds), Pelicans, Bananaquits and Hummingbirds. Twin Agaves grow along the edge of the villa grounds. A typical day at a Water Island beach. 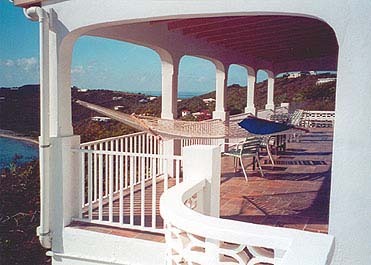 View of the expansive porch space, from the villa grounds.